Welcome to the Andaman and Nicobar Islands. From plane or helicopter, Andaman Islands look like green emeralds scattered over the turquoise sea. We lived here for 5 weeks and traveled from north to south and west to east. The interior of Andaman Islands is mostly untouched rain forest, as well as 90% of the beaches on the coast. If you want to experience the white sand beaches under your feet, the turquoise sea in front of your eyes and the green jungle behind you, and to have all these just for yourself, like Robinzon, the Andaman Islands are just perfect place for you. But beware! There are bits of hell inside this paradise. Our blog will help you to be well prepared and to enjoy the best of the archipelago. There are 572 Andaman and Nicobar Islands. As of July 2018, only 23-24 islands wereaccessible to visitors. Of that, you were only allowed to overnight on 12 of the Andaman Islands, others can only be visited on a day trip. The Nicobars have been completely closed. Only in August 2018 Indian government announced opening Nicobar islands to tourism, along with easing restrictions on Andamans. Soon, the number of islands, accessible to outsiders, will rise to 29 inhabited and 11 uninhabited islands. You may find a lot of information saying RAP or Restricted Area Permit is necessary to visit Andamans. Since August 2018, the RAP regime was cancelled and all the islands the islands, described in this guide book, are free to go. We are talking about a large archipelago, thus ships, ferries and boats are, of course, the key option for getting between the islands. Ships connect the capital, Port Blair, with most of the inhabited islands on the archipelago. Port Blair is connected to the Middle and North Andaman by Andaman trunk road. Handful of buses run south to north daily. You will find long distance, express busses on Andaman islands, as well as suburban buses linking administrative centers such as Rangat, Mayabunder and Diglipur and adjacent villages. Large islands such as Havelock and Little Andaman run local buses too. Between some of the towns and islands of the archipelago, you can try your luck and fly a helicopter. 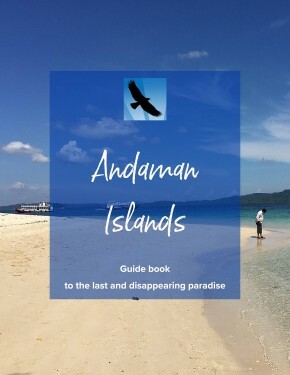 For detailed guide about transport please visit "Getting around Andaman Islands" dedicated chapter here. Accommodation here is very diverse: from bamboo cottages with mattress on the floor and prices somewhere from 6-7 € per night to overpriced accommodation at over 100 € a night. These expensive accommodations are located mainly on the island of Havelock and my sincere warning is: if someone asks Havelock for a lot of money, it does not mean that it offers good quality. Read our honest advice to other travellers and details about accommodation in Andaman Islands here. How to plan your a trip and which places you definitely may not miss? Play Robinzon and spend the day on the uninhabited island. Go through the magnificent jungles, without any worry about dangerous wildlife, swim in the waterfalls and of course snorkel and dive. Check Andaman Islands Itinerary and highlights here. Neil Island, together with its bigger neighbor Havelock are two most visited Andaman islands and thus two most touristy ones. Visitors mostly tend to think of Neil island as being more quiet alternative to Havelock. Having visited 12 Andaman islands, I have difficulties to agree with that.